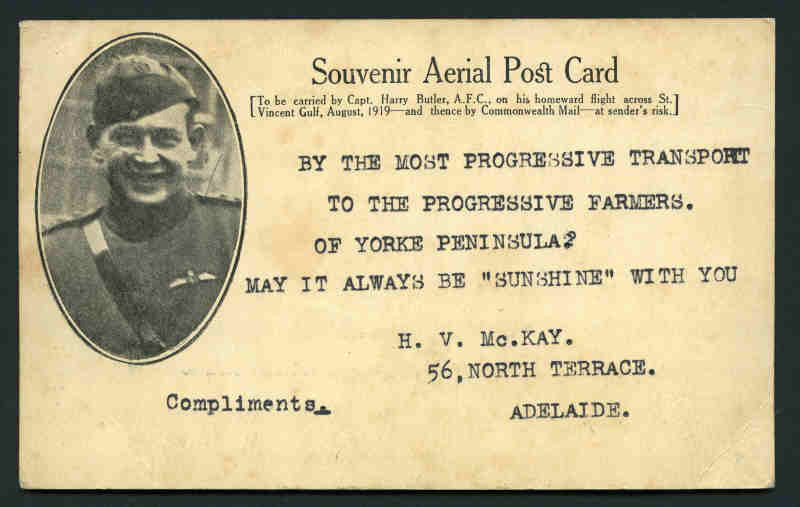 1919 Postcard showing view of plane over South Australia, flown by Harry Butler on his flight from Minlaton to Adelaide with message from H.V. McKay Massey Harris. Lightly bent lower left corner. Rare. AAMC 21b. 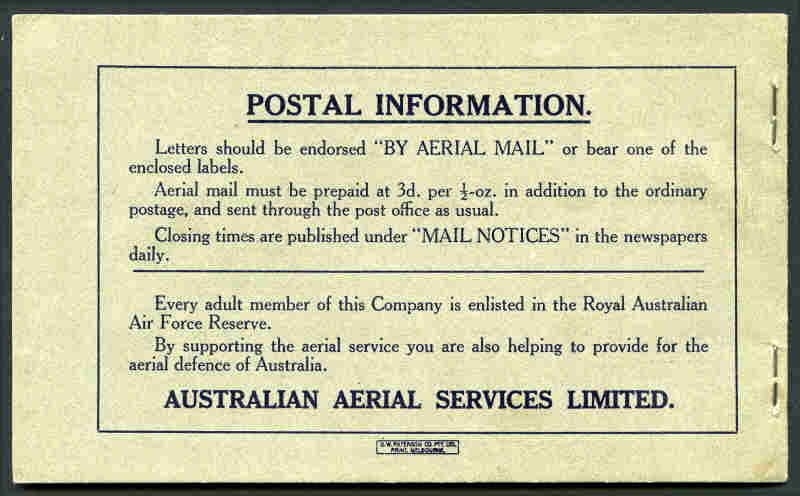 1925 Australian Aerial Services Limited Angel Vignette complete booklet of 3 panes of Air Mail labels. 28 Oct 1925 is rubber stamped on cover, otherwise in excellent condition. Scarce. A.A.M.C. 90b. Frommer 14c. Catalogue Value $600.00. 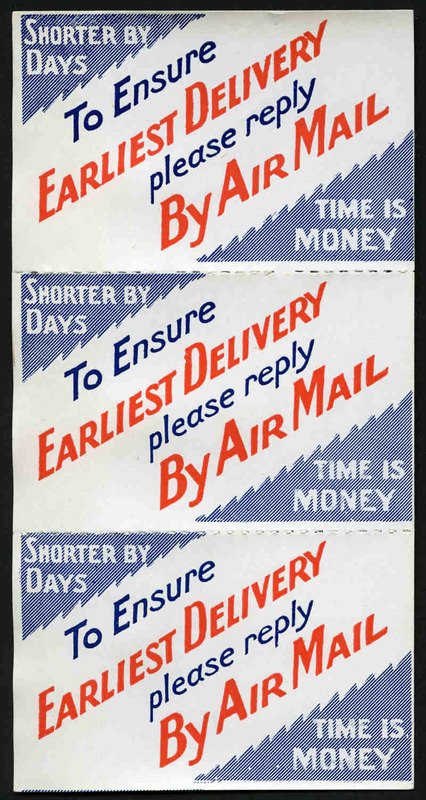 1929 West Australian Airways Ltd 'By Air Mail' label strip of 7 (13) and 'To Ensure/Earliest Delivery/Please Reply/By Air Mail' vignette strip of 3 (15), plus 2 copies of the East-West Air Mail Service, with accompanying letter from West Australian Airways Ltd., in original On Airways Service envelope. 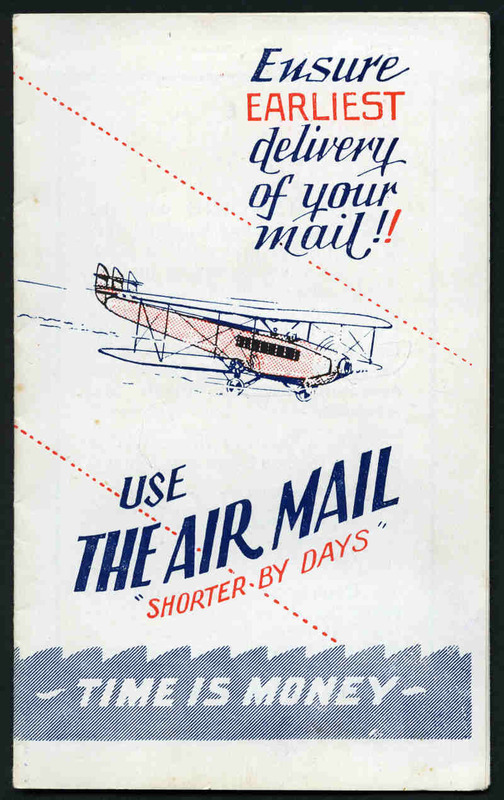 Envelope grubby, otherwise fine. Frommer 21b and 22b. Catalogue Value $1,400.00. 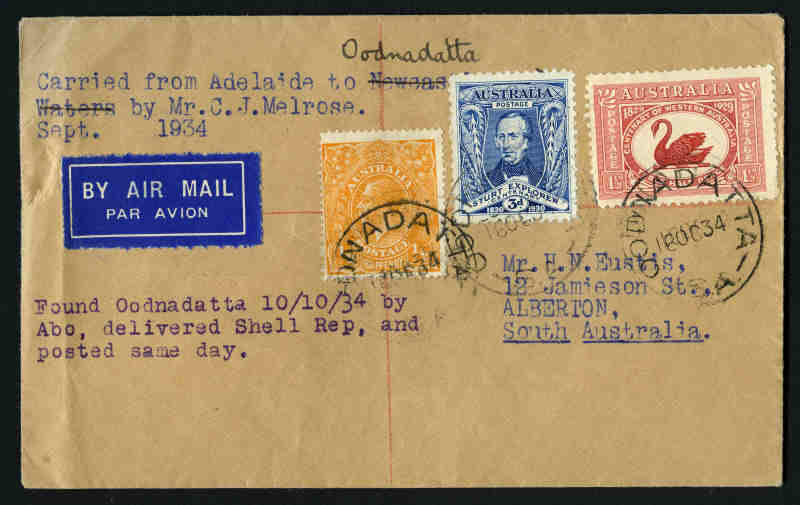 1934 (17 September) Air Mail cover "Carried from Adelaide to Oodnadatta by courtesy of Mr C.J. Melrose. 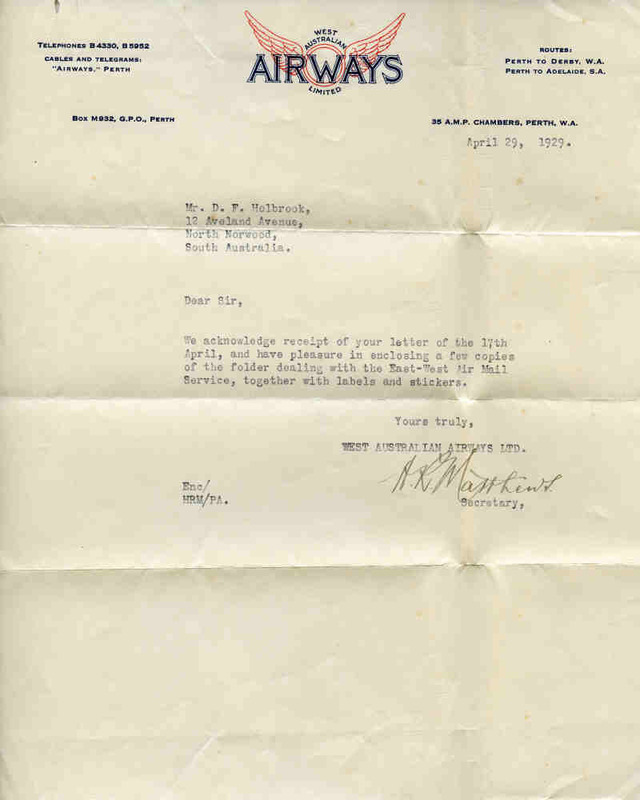 Sept. 1934" en route to England with typed message "Found Oodnadatta 10/10/34 by Abo, delivered Shell Rep and posted same day", cancelled Oodnadatta 16OC34. 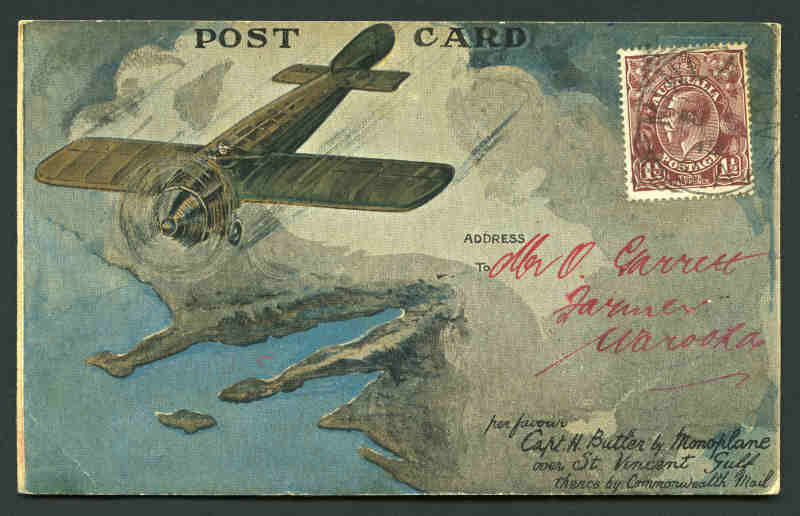 The plane did not land at Oodnadatta but dropped the mail by parachute, with only 4 covers dropped. Light fold and tiny tear at left. AAMC 402. 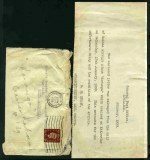 1939 Koranga crash cover, which occurred en route from Darwin to Adelaide, at Katherine River, Northern Territory with letter from the Post Office apologising for the delay and the condition of the article. Tatty cover with usual water damage as would be expected. AAMC 843. 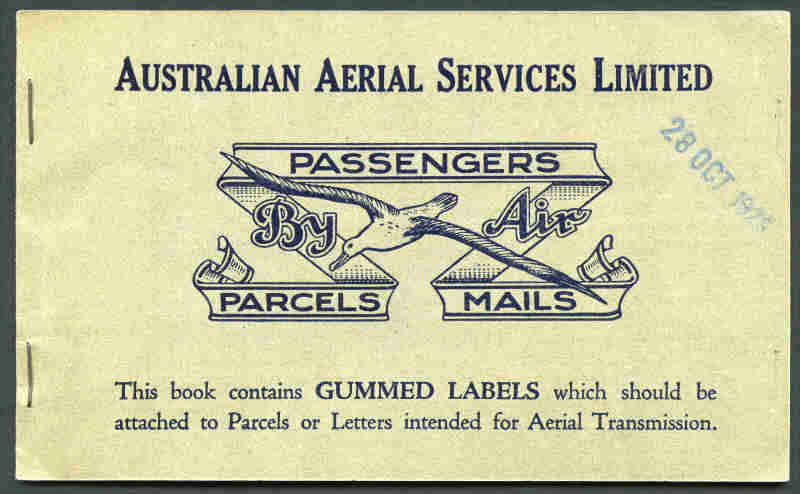 Selection of 77 First and Commemorative Flight covers from 1929 to 1978, mainly carried on internal Flights or Flights to, from or within Australia and the Pacific Islands. Odd fault and few duplicates.